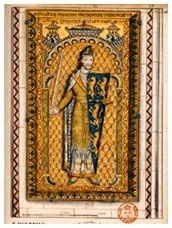 William, born in Conches (Normandy), was one of the most famous masters of the schools which flourished in Northern France during the first half of the twelfth century. His teaching activity extended from 1120 to 1154. According to one of his most illustrious disciples, John of Salisbury, who later became bishop of Chartres (1176–1180), William was the most talented grammarian (grammaticus) after Bernard of Chartres.For many years historians have agreed that William taught at the Cathedral School of Chartres, an opinion which has been questioned recently. We must recognize that the life of William remains obscure and that direct proofs of his teaching in Chartres are lacking. Nevertheless we know that he taught for a certain time in an episcopal school, near a cathedral dedicated to our Lady, that he got angry with the bishop and finally took refuge at the court of Geoffroy Plantagenet, duke of Normandy. We have good reasons to think that the church dedicated to our Lady, where William taught, was Our Lady of Chartres. William of Conches was renowned not only as a grammarian (grammaticus), but also as a physicus, a term which, in his time, applies both to the physicist and to the physician. He was interested in natural sciences: astronomy, geology, optics, anatomy, physiology, etc. All of his works have an encyclopaedic character. Two of them — the Philosophia and the Dragmaticon — may be considered as books of popularization. The latter, a dialogue between a philosopher and the duke of Normandy, brings to mind those vernacular books of the Middle Ages written ‘for the laity.’ Although the Dragmaticon was written in Latin, its style is familiar, spontaneous, witty, quite the opposite of pedantic scholasticism. Besides these systematic treatises, William also wrote commentaries: on Plato’s Timaeus, on Boethius’s Consolation of Philosophy, on Macrobius’s Commentary on the Dream of Scipio, on Priscian’s Institutiones grammaticae. These commentaries, which William prefers to call Glosae, have been long neglected. Consequently, most of them have remained unedited. However, modern scholarship is now paying more attention to them, and rightly so. For these commentaries, often written in haste, reflect the everyday life of a school more faithfully than elaborated treatises. Thanks to these Glosae, the modern reader is ushered into a medieval school and introduced to the methods and the spirit with which teaching was offered there by masters like William of Conches, a method and a spirit which John of Salisbury praised so highly. There is another reason to pay more attention to the works of Wlliam of Conches, for they exerted an influence which reaches far beyond the confines of the twelfth century. This is the case not only of the systematic treatises (Philosophia, Dragmaticon), but also of the commentaries, particularly the commentary on Timaeus, for which William was deservedly listed by Marsilio Ficino among the “noble platonists” who commented on that famous dialogue. Since these commentaries (or Glosae) have remained unpublished, the first task has been to provide modern scholars with critical editions. Therefore the late Abbot Dom Eligius Dekkers, OSB, founder of the series Corpus Christianorum, decided to include an edition of the complete works of William of Conches in this series. To coordinate this edition, he chose Édouard Jeauneau, fellow of the Pontifical Institute of Mediaeval Studies in Toronto. In the prologue to his Heptateucon, Thierry of Chartres describes in six hexameters the travels of Grammatica from Egypt to Greece, and from Greece to Rome. One would expect Thierry to continue describing the voyage and, perhaps, to make Grammatica stop at the great schools of his own time. But, no doubt to the disappointment of many, his wonderful exposition of the translatio studii stops neither at Chartres, nor at Paris. And yet the tradition he describes unquestionably stopped at Toronto, and at the Pontifical Institute of Mediaeval Studies. For, if we still have access today to this ‘Bible of the Seven Liberal Arts’ it is because we are indebted to the Institute. On 26 May 1944, a bombardment by the Allies destroyed the major part of the Bibliothèque municipale of Chartres and, among other things, MSS 497 and 498 containing the Heptateucon of Thierry. This remarkable witness of the twelfth-century renaissance would have been certainly lost, had not the Institute made a microfilm of it prior to the War. Hence, if the text of the Heptateucon is still available today, in Chartres and elsewhere, it is due to the Pontifical Institute of Mediaeval Studies. Etienne Gilson, the founder of the Institute, himself mentioned the fact, with justifiable pride, in an interview given to a French newspaper in 1953. During the second half of the twentieth century the Institute has helped make available the works of the Chartrian Masters and advance a better understanding of their teaching. Three fellows of this Institute, Nikolaus M. Häring, Brian Stock, and Édouard Jeauneau, devoted some of their seminars to the School of Chartres. This renewed interest in the School of Chartres gave birth to some significant studies. Three of them were published by Father Nikolaus Häring as part of the Institute’s Studies and Texts series: The Life and Works of Clarembald of Arras, a Twelfth-Century Master of the School of Chartres ST 10 (1965); The Commentaries on Boethius by Gilbert of Poitiers ST 13 (1966); Commentaries on Boethius by Thierry of Chartres and His School ST 20 (1971). Several years later, Karin M. Fredborg edited The Latin Rhetorical Commentaries of Thierry of Chartres for the same series, ST 84 (1988). Brian Stock’s thesis (published as Myth and Science: A Study of Bernard Silvester [Princeton, 1972]) and teaching played an important role in the orientation of the research of his students. One of them, Haijo Jan Westra, published the interesting twelfth-century Commentary on Martianus Capella’s De nuptiis Philologiae et Mercurii attributed to Bernardus Silvestris as Studies and Texts 80 in 1986. Édouard Jeauneau offered some seminars on Plato’s Timaeus, Boethius’s Consolation of Philosophy and Macrobius’s Commentary on the Dream of Scipio, with references to William of Conches. One of his students, Paul Edward Dutton, chose as a subject of research for the Doctorate in Mediaeval Studies at the Institute an important twelfth-century commentary on Plato’s Timaeus, which he edited for the first time: The Glosae super Platonem of Bernard of Chartres [Studies and Texts, 107], Toronto, 1991. The role of Édouard Jeauneau, as director of the project, has been to find editors for each of the various works of William and to ensure that a certain harmony of style is observed. A summary of his efforts may be found in the recent edition of the Glosae super Platonem (Turnhout, 2006), pp. x–xv. For information on ordering, please contact Brepols Publishers. Guillelmi de Conchis Dragmaticon philosophiae. Ed. Italo Ronca. Opera omnia 1. Corpus Christianorum Continuatio Mediaevalis 152. Turnhout: Brepols, 1997. ISBN 978–2–503–04521–4. Guillelmi de Conchis Glosae super Boetium. Ed. Lodi Nauta. Opera omnia 2. Corpus Christianorum Continuatio Mediaevalis 158. Turnhout: Brepols, 1999. ISBN 978̵;2–503–04581–8. Guillelmi de Conchis Glosae super Platonem. Ed. Édouard Jeauneau. Opera omnia 3. Corpus Christianorum Continuatio Mediaevalis 203. Turnhout: Brepols, 2006. ISBN 978–2–503–05039–3. Philosophia. The edition of the Philosophia in its two redactions (Versio prior, Versio altera) is in preparation by Paul Edward Dutton (Simon Fraser University). Professor Dutton has considerably enriched the list of manuscripts containing the Philosophia: see his Étienne Gilson Lecture, The Mystery of the Missing Heresy Trial of William of Conches (Toronto, 2006). Glosae super Macrobium. An edition of the Glosae super Macrobium has been in preparation by Professor Helen Rodnite Lemay (State University of New York at Stony Brook) since November 1988: see Glosae super Platonem, ed. É. Jeauneau (Turnhout, 2006), pp. xi–xii. I. Glosulae de magno Prisciano [Institutiones I–XVI]. Versio altera. Ed. Édouard Jeauneau with the assistance of Andrew Hicks, Michael Elliot, and Stephen Pelle. II. Glosae super Prisciani Librum Constructionum [Institutiones XVII–XVIII]. Ed. Édouard Jeauneau with the assistance of Winston Black and Andrew Hicks. III. Glosulae de magno Prisciano [Institutiones I–XVI]. Versio prior. A qualified scholar has shown interest in the project. Supplementum II: Anonymi Summa Philosophiae. Ed. Paul Edward Dutton (Simon Fraser University). Supplementum III: Radulphi de Longo Campo Cornicula siue Summa de Philosophia. Ed. Irène Caiazzo (CNRS).